Thulimaya Tamang, a resident of Pipara Simara, Bara tenderly takes care of her cow. This cow is a prized possession – after all it has helped to increase her household income. She now saves NRs. 2000 per month after paying for cow fodder and deducting her monthly loan installment. Thulimaya's monthly income will have a whopping increment of 180% after her loan is paid off. Imagine hunting a near threatened animal as a traditional practice for food and realizing one fine day that the practice is wrong! This is what happened in a few VDCs of Nawalparasi district: Deurali, Naram, Ruchang, Dhaubadi and Hupsekot. Communities came together and decided to protect the Himalayan goral (Nemorhedus goral), demonstrating strong local stewardship and local engagement in conserving a vulnerable species. Jhabilal Ranamager, local resident of Dhaubadi VDC says, "When we hunted goral, the studier ones always got away and those that got killed were the pregnant, sick and old goral. What moved us was to find an infant inside the carcass almost all the time. It made us feel guilty and coldblooded." The steep slopes of Amdanda, Gaighat and Sinchangghadi in Devghat VDC were used for shifting cultivation – an agricultural land use system where land is cleared of forest and cultivated until its fertility diminishes, after which it is abandoned. This kind of land use system intensifies deforestation and forest degradation. This practice resulted in frequent landslide and soil erosion along the banks of Trishuli river adjoining Mugling-Narayanghat highway. Restoration in this area is particularly critical given that it serves as a forest corridor to enhance the ecological connectivity of the Chitwan Annapurna Landscape (CHAL). •	National consultation meeting conducted on Environmental and Social Impacts of Large Infrastructures in Nepal. The consultation was based on the study ‘An overview of Existing and Planned Key Infrastructure in the Terai Arc Landscape and Chitwan-Annapurna Landscape, and its Environmental and Social Impacts’. •	REDD working group meeting held at the REDD cell, chaired by the Secretary of the Ministry of Forests and Soil Conservation (MoFSC) endorsed the REDD+ strategy framework for Nepal developed by the REDD Cell, MoFSC with the support of the Hariyo Ban Program. •	The second phase of red panda monitoring in Langtang National Park (LNP) initiated. •	A large-scale plantation began in different VDCs of Kaski where a total of 25,300 seedlings were planted. •	Hariyo Ban Program in coordination with Bhimapur VDC office awarded scholarships worth Rs. 8,000 (Rs. 7,500 from Hariyo Ban) to 11 wildlife victims. •	The activities outlined in the Community Adaptation Plan of Action (CAPA) in Ranikhola CFUG, Dahakhani VDC are nearing completion. •	National interaction and sharing workshop on Payment for Ecosystem Services (PES) conducted in Pokhara, Kaski. •	A support of duna-tapari (leaf plate) machine was made to a duna tapari enterprise in Bandipur VDC, Tanahu. •	A 5 km long barbed wire fence installed in the Buffer Zone of Bardiya National Park – Amreni, Karmala and Jariyaphanta BZCF. •	Monsoon dolphin monitoring survey completed in Geruwa, Karnali and Mohana River. •	Tea plantation piloted in Bhadaure Tamagi and Chapakot VDCs of Kaski district. Altogether 54,000 tea seedlings planted on both community and private land. 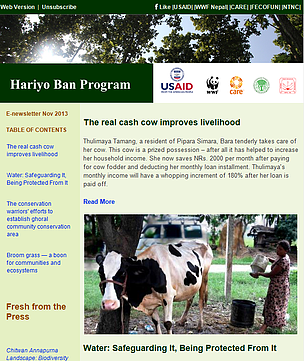 •	Support to develop and maintain official Bardiya National park website provided. •	A 7.3 km electric fence installed in Panchakanya and Chaturmukhi CFUG, Padampur VDC, Chitwan. •	Training on climate change and Reduced Emissions from Deforestation and Forest Degradation (REDD+) for local journalists conducted. •	A skill based training on rattan handicraft provided in Jhalari, Kanchanpur and mushroom farming in Farm Tole, Basudevpur, Banke. •	Regional multi stakeholder consultation workshop on Emission Reduction Program Idea Note (ER-PIN) development for Terai Arc Landscape (TAL) conducted in Dhangadhi, Nepalgunj, Butwal and Hetauda. •	Initial findings of the study Moving Down or Not? A key question for Samzong, Yara and Dheye, three villages in Upper Mustang, Mustang District, Nepal was shared. •	Training of Trainers (ToT) on Environmental Mitigation and Monitoring Plan (EMMP) preparation was conducted in Sauraha, Chitwan. •	Sirdibas VDC, where toilets have been built in all houses with partial support from Hariyo Ban Program, was declared as open defecation free zone on 29 October, 2013.